TL;DR If you follow Facebook news, you certainly heard about the Big News: launch of Dynamic Product Ads (DPA), announced only two days ago. We in ROI Hunter are super excited about this new feature and thought to give you a quick overview of what DPA does and why you should care; including a step-by-step instructions on how to set everything up, to start re-market like a king in ROI Hunter. When we first heard about DPA, we had mixed feelings. 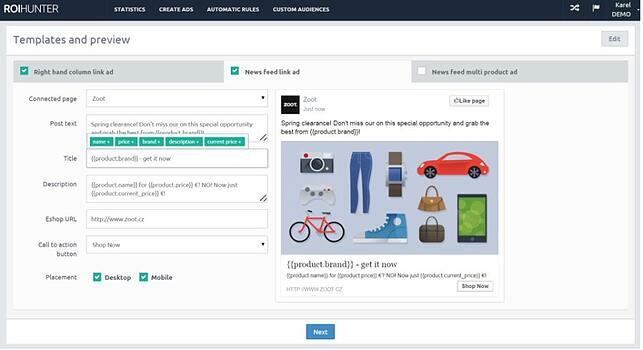 The XML feed integration has been one of the key features of ROI Hunter for some time already, given our focus on e-commerce, so it first felt almost like “Facebook has copied us!”. But then we realized that DPA actually further enhances our existing proposition and underlines that our way of doing things is the right approach to Facebook advertising. And the opportunity here is enormous, with all parties benefiting: Facebook, e-commerce businesses, Facebook marketing partners and of course – Facebook users. As an e-commerce player with large inventory and significant traffic, you have certainly faced this dilemma: to achieve good ROI in scale, you either have to stick to few ads, showing the most successful items with general messages, or you create huge number of ads (which may be time-consuming even with many ROI Hunter features that automatized large chunk of the manual work). DPA let you connect the XML feed and create one template that will show all your products, including the long-tail items, to exactly selected people who visited the product page – right people, right time. Unlike Facebook Exchange (FBX), DPA are user-based, not cookie based. As long as the users are logged on Facebook, you know it’s them – no matter what device they use. This is extremely important also due to mobile (either app or mobile web) becoming more and more important. People multi-screen and you should get accustomed to it. Auto-updating – the XML feed is being updated daily and so change of description, price or the product out of stock doesn’t cause any troubles. As your shop grows – your Facebook Ads inventory does too. Setting up the campaign is actually very easy once you have the basics (XML feed in the right format and enhanced WCA pixel) correctly implemented (see attached manual for more info). You will still need to play with the wording and images (DPA is just a tool, the right creatives still need to be done by you), but you don’t have to spend ages creating ads one by one anymore. Much as we like DPA, and think that they are extremely powerful in increasing your ROI, we believe their impact on scaling your business has its limits. To be able to grow your operations further, you still need to bring new traffic to your website or return people to sections of your e-shop other than just the products (e.g. categories, carts, special offers, sales etc.). For this, you need to run multiple campaigns – including broad awareness campaigns, category re-targeting or unfinished purchase re-marketing to name just a few. None of these can be done through DPAs. Moreover, to deliver the best results, all campaigns need to be tested and optimized in real time, which is impossible to do manually. This is how you edit DPAs in ROI Hunter. That’s why we see DPA as a great enhancement of ROI Hunter’s current features, such as Predictive and Bulk creation of ads for any section of your e-shop or Automatic Rules that manage and optimize your campaigns 24/7, and believe that our platform now becomes one of the most powerful Facebook performance ads tools out there, if not the most powerful one! If you want to get detailed, step by step instructions on how to align your XML feed and update the FB Pixel code, please enter your e-mail and download our free manual: Dynamic Product Ads & ROI Hunter – all you need to know. The first test campaigns we ran with some of our clients look great – look forward to launching first DPA campaigns with you soon! Want to get more information on our clients’ success stories? Check our Facebook Marketing Partners profile! “Facebook has copied us!”. But then we realized that DPA actually further enhances our existing proposition and underlines that our way of doing things is the right approach to Facebook advertising.